Flash Floods Turn Deadly In Southwest France's Aude Region Three months' worth of rain fell in just a few hours, France's Interior Ministry says. One resident called it "the apocalypse." 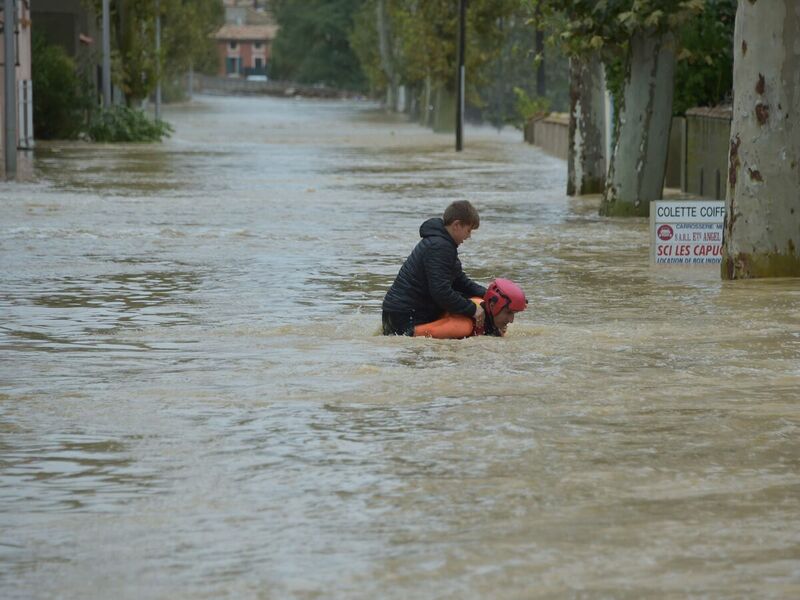 A firefighter helps a youngster reach safety in a flooded street during a rescue operation following heavy rains that saw rivers bursting their banks in Trèbes, near Carcassonne, in southern France. Flash floods have killed about a dozen people in the Aude region of southwest France, according to multiple local news outlets. A resident in one village called it "the apocalypse" as intense rains overwhelmed roads and drainage systems overnight into Monday morning. Three months' worth of rain fell in just a few hours, France's Interior Ministry says, adding that some areas saw up to 14 inches. The rainwater was driven by winds up to 60 mph. Several residents told local media that the situation sharply deteriorated around 3 a.m., forcing people to scramble to higher ground as they sought safety. The high water moved with violent force, tearing bridges away from roadways and flooding homes, as seen in video and photos from the scene. Authorities initially put the death toll at 13 and then at 10, but the Interior Ministry later said 12 people had been killed. In Villegailhenc, where at least two bodies were discovered, Nicolas Masson told Midi Libre that it was as if a wave fell upon the village — which he said now "is a lake." In the same town, a man named Stéphane told the news outlet, "It's the apocalypse." The Aude River rose by 7 meters (23 feet) in some places, the local prefecture said. Officials say it hasn't reached such levels since 1891. 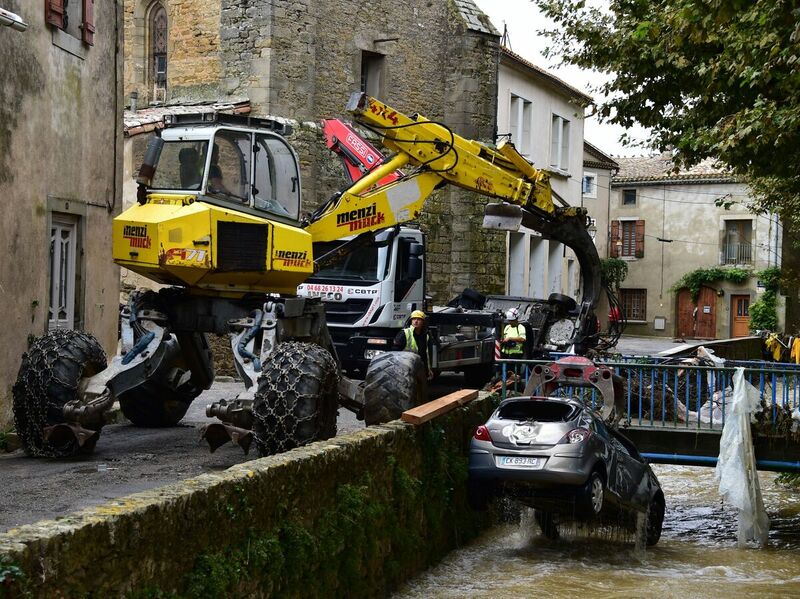 An excavator pulls a car from a river in Villegailhenc. It was just one of many vehicles that were damaged in flash floods overnight in southwest France. France's Interior Ministry says the government has fully mobilized to help in the crisis; it's also warning people to stay off roads and to try to limit their use of phones so that emergency operators are able to use the limited capacity that's available. The French government says 350 firefighters were working to provide relief, with 350 more on the way. Officials also deployed 160 police officers and seven helicopters to try to help those in need. NPR's Soraya Sarhaddi Nelson reports that France's national weather agency, Meteo France, issued a red warning for the Aude River, predicting more flooding and urging people in the area to practice "absolute vigilance." "Floodwaters were in some cases too powerful for the emergency services to get through, even on boats," France 24 reports, citing Alain Thirion, prefect of Aude. More than a thousand people evacuated their homes after emergencies were declared in the communes of Pezens and Cuxac d'Aude. The Aude sits along the Mediterranean, east of Toulouse and about 25 miles north of the border with Spain. Schools reportedly have been closed in affected areas. The Hospital Center of Carcassonne canceled all noncritical operations for Monday, citing road conditions and communications problems. Prime Minister Édouard Philippe is expected to visit the site of the disaster on Monday.